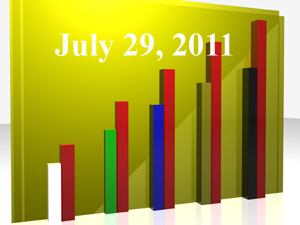 “Momentum Builds to Place IRAs Under Fiduciary Umbrella,” (Fiduciary News, July 5, 2011). Having no idea what the fiduciary means, and worse, not caring, most IRA R/O investors are sheep heading for their (financial) slaughter. Not anymore, if the DOL’s Phyllis Borzi has her way. The lobbyists have the pressure on full boil as they sic their Congressional minions on the stalwart Phyllis Borzi. Puppy-eyed fans look on in hopes she can stand the heat. “Broker-dealer groups heavily armed in fiduciary battle,” (InvestmentNews, July 17, 2011) The Goliaths of the industry have the heft to move mountains – and possible thwart the universal fiduciary standard the Davids (investors and RIAs) hope will make life fair. “Dodd-Frank and Fiduciary: Why I’m Depressed; What to Do,” (Advisor One, July 21, 2011) Harold Evensky sings a song of lament that might depress you as much as he is. “Coming this fall: Single fiduciary rule, says Schapiro,” (InvestmentNews, July 21, 2011) Despite Evensky’s depression (see above), Mary Shapiro comes through and promises a uniform fiduciary standard before year end that would apply to all retail investment advisers. Finally, the hope of a level playing field to benefit all investors. Well, maybe not institutional investors, but here’s hoping the DOL follows through. “Ketchum on exams, VAs and fiduciary standard,” (InvestmentNews, July 24, 2011) This is a transcript of the remarks made by Richard G. Ketchum, chairman and chief executive of the Financial Industry Regulatory Authority Inc., at the June 28, 2011 Insured Retirement Institute’s Government, Legal and Regulatory Conference in Washington. The key takeaway regarding the fiduciary standard – of course disclosure will be necessary, but it’s not enough. “Congress to DOL’s Borzi: Repropose Fiduciary Rule, Too Broad,” (Advisor One, July 26, 2011) Well, well, well, it looks like all that lobbyist money couldn’t budge Borzi, but it has no problem moving Congress. You can tell it’s lobbyist money because it was a bipartisan effort. C’mon, these guys can’t agree on anything and they agree on this? How foolish do they think we are? Let’s see if Borzi can stand up to the pressure the same way she stood up to the industry. “Congress to Borzi: Repropose fiduciary rule,” (BenefitsPro, July 26, 2011) More good stuff from Borzi. The article includes another quote from her, this one given in her testimony, that explains how the narrowness of the old rule has hurt retirement plans, including IRAs. “Borzi Makes Case for Fiduciary Definition Change,” (PLANSPONSOR.com, July 26, 2011) Here’s the best piece that gives you a piece of Borzi’s mind as she confronted Congress. “Get a Grip On 401k Fiduciary Responsibilities,” (Financial Advisor, July 27, 2011) The article implies the question: Are you sure you want to be a 401k plan fiduciary? Check out the answers it provides. “ASPPA Clarifies Stance of Definition of Fiduciary Proposal,” (PLANSPONSOR.com, July 28, 2011) Yes, the ASPPA is against have the new fiduciary rule include IRA holders. Apparently, the ASPPA believes is OK for IRA holders to continue to be exposed to higher costs, lower returns and blatant conflicts of interest. This actually leads to an interesting philosophical questions – who’s responsible for protecting the interests of the consumers? The vendors? The government? The consumers themselves? It’s been said the doldrums of summer offer the best opportunity for naïve reporters to start tackling the hard issues. With everyone off to the shore, their musings won’t fall on absent eyes, so all will be forgiven and forgotten. “ETFs At Last: The Future of 401k Plans,” (Advisor One, July 2011) Wow, this is really a poorly written article. It’s tough to figure out why the editor allowed it to be published. Maybe it’s the summer and standards are relaxed. Here are three bad things about this piece: 1) It offers nothing new, despite the promise of the title; 2) It is either factually incorrect or merely misleading (it claims mutual funds have higher expense ratios without explaining the difference between active and passive mutual funds – the latter of which are more comparable to the bulk of the ETFs currently available); and, 3) It uses the DOL’s fee disclosure as a reason for investors to purchase lower expense ratio funds, even though they might not be an appropriate investment vehicle for investors and the DOL specifically said they did not mean for the emphasis on lower fees to imply one should invest in index funds. “The Hidden Costs of Passive Investing,” (Investing Daily, July 14, 2011) The title offers more than the article actually delivers. While the piece does point out to the “lemming problem” posed by massive index investing (i.e., with too many investors in index funds, any single mass trade may lead them all over the cliff), it then performs a U-Turn and says, “Nah, it’ll never happen… well maybe in foreign index funds, but not domestic index funds.” Folks, you heard it here first: When the critical mass is reached, there will eventually be an index fund implosion.